Don’t keep searching car dealers in Milwaukee trying to find your next truck when Ewald Chevrolet Buick has your truck right here. You heard that right! Stop searching other car dealers in Milwaukee because Ewald Chevrolet Buick in Oconomowoc WI has an incredible selection of used Chevy Silverado trucks for sale. Including the used Chevy lifted trucks for sale in WI. When you want to find a diverse selection of used Chevy trucks for sale you only need one Chevy dealer in Wisconsin and that is Ewald Chevrolet Buick. With our incredible selection of used Chevy Silverado trucks for sale, you are sure to find the truck that you are ready to call your own. So, come out to your Chevy dealers in Wisconsin at Ewald Chevrolet Buick. Check out our used Chevy Silverado trucks for sale and used lifted trucks for sale in WI and claim one as your own today. We want to meet you and answer all your questions about our used Chevy Silverado trucks for sale in WI. If it is used Chevy Silverado lifted trucks for sale in WI, we have just the used Chevy Silverado for you. Like the used 2015 Chevrolet Silverado 1500 LTZ for sale. This used Chevy lifted truck for sale is an amazing find. This used Chevy Silverado lifted truck for sale in WI has an incredible ground clearance as well as an outstanding towing capacity. This used Chevy Silverado lifted truck for sale in WI comes with many incredible features. You surely won’t want to miss out on them when looking for the perfect lifted truck. Including navigation, leather, and a Black Widow lift kit. You really need to come in and check this gorgeous lifted truck out for yourself to see the incredible features. Just to mention a few more, you will also find power running boards, heated seats, and a tonneau cover. A tonneau cover is great to keep all of your personal belongs in the bed of your truck safe and dry. If this used Chevy Silverado lifted truck for sale isn’t the one for you, check out one of the other used Chevy trucks for sale near you. At Ewald’s Chevy dealer in Wisconsin, we are happy to sit down and help you figure out just what your everyday needs are when it comes to your next used Chevrolet Silverado truck for sale near Milwaukee. We can help you search through our entire truck inventory to find a used lifted truck for sale that is perfect for your day to day needs. Don’t spend time valuable time searching other car dealers in Milwaukee because you can browse through our online inventory selection of used Chevrolet Silverado trucks for sale. We can’t wait to work closely with you to find the perfect used Chevrolet Silverado truck for you. 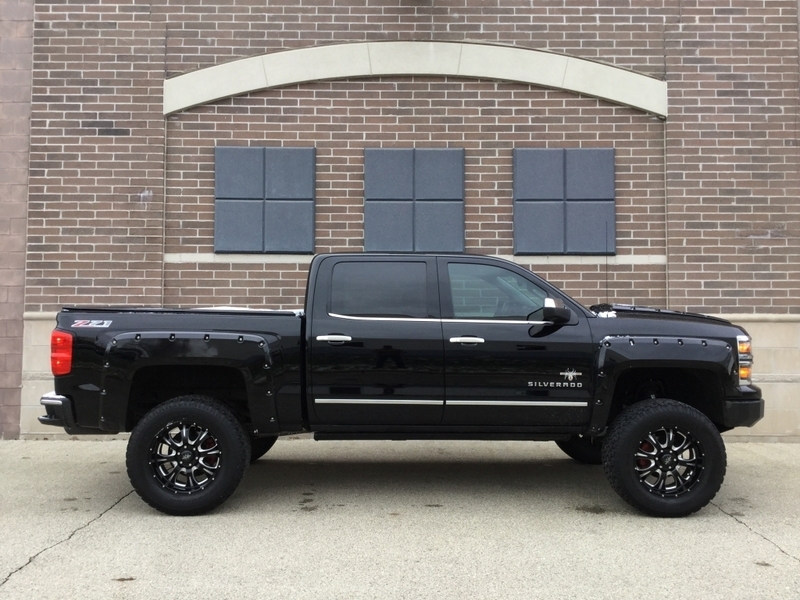 When it comes to buying your next used Chevrolet Silverado lifted truck for sale, let Ewald’s Chevy dealers in WI be your car dealership near Milwaukee. You can give us a call at (262) 226-2842 to schedule your test drive. Or, check us out in person at Ewald Chevrolet Buick located at 36833 E Wisconsin Ave Oconomowoc WI, 53066.